FONDATION ALBATROS IS A FAMILY RUN PHILANTHROPIC ORGANISATION GOVERNED BY SWISS LAW AND BASED IN GENEVA. Since 2008, Fondation Albatros has been supporting social and humanitarian organisations involved in the improvement of the living conditions and prospects of underprivileged populations through the implementation of sustainable solutions. The Albatros Foundation came into being because of the desire of its founder, Claude Demole, to offer his aid to the most vulnerable people to enable them to acquire the tools necessary to build a life punctuated with accomplishments synonymous with autonomy and self-worth. Since 2008, Foundation Albatros has been supporting social and humanitarian organizations involved in the improvement of the living conditions and prospects of underprivileged populations through the implementation of sustainable solutions. The Foundation is particularly involved in the area of education, first lever of development. In addition, to promote women’s education belongs to its objectives. The foundation is particularly involved in the areas of education and gender equality promotion. Furthermore, the Foundation appreciates community development programs. The Foundation welcomes both private and public partnerships. Students, teachers and the management team benefit from facilities adapted to the high quality vocational training the PSE Institute is dedicated to provide to the poorest. The School trains to business trades more than 300 students, in particular young women. 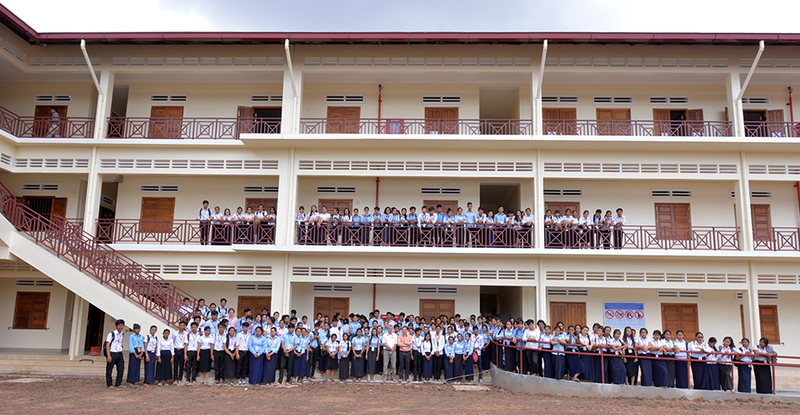 It offers several vocational curricula leading to diplomas accredited by the Cambodian Ministry of Vocational Training and Labor. It goes from Technical Vocational diplomas to a Bachelor in Business Administration. Curricula cover two to three years of studies. There are two Technical Vocational Diplomas in Retail Sales and Administration & Accounting, three Higher Diplomas in Human Resources, Retail Business and Accounting and one Bachelor in Business Administration, completed in one year after graduating from one’s of SoB’s High Diplomas.Trainings include a large part of operational learning through projects and internships. They also include the teaching of soft skills. Almost 100% of the graduates enter the Cambodian job market right after the end of their studies. They make rapid progress in their companies. The Albatros Foundation supports the training of 45 students at the PSE School of Business for the whole length of their curriculum.